Dubai: More than two years after the United Kingdom voted in a referendum to leave the European Union (EU), Prime Minister Theresa May earlier this week got her cabinet to agree on a deal that will see Britain exiting from the EU. Analysts and financial experts say the deal comes with huge costs for the economy and London’s financial service industry. While May has convinced her cabinet that the deal was the best the world’s fifth-largest economy could hope for and that the other options were leaving with no deal or thwarting Brexit, critics within her party and the opposition are not convinced. This leaves the chances of the deal getting passed in the parliament in doubt, adding further ambiguity to the economic outcome of Brexit deal. “When parliament rejects the prime minister’s proposal, as surely it will, there will still be time for ministers to negotiate something better,” Nick Timothy, one of May’s former chiefs of staff wrote in the Daily Telegraph newspaper. London’s financial services sector too is not convinced about the deal given the political certainty. “The parliamentary arithmetic has looked tight for some time. It now looks tighter, given signs of greater unity among those who object to the draft Agreement,” Goldman Sachs said in a note to clients. 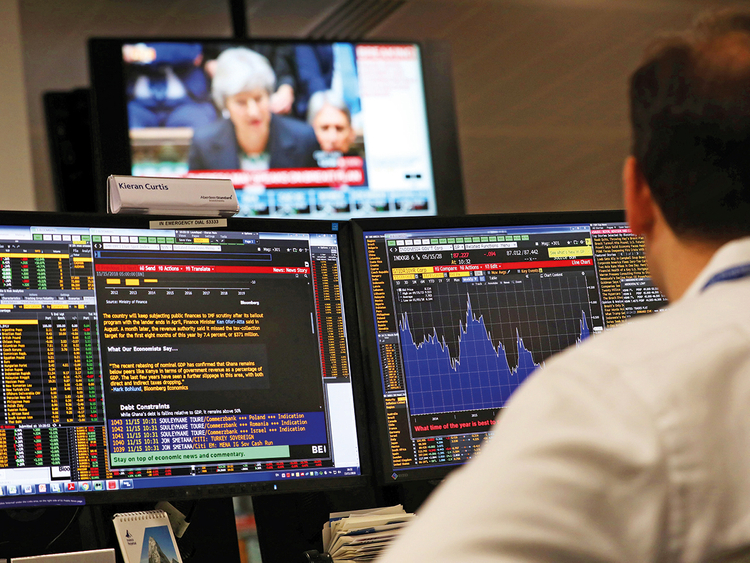 Although the cabinet nod to May’s Brexit deal is touted as one step forward, many analysts see it has just added to risk perception on the pound, the economy and the financial markets. “Euro-sceptic Tories are against the UK being restricted and want to strike trade agreements with the rest of the world, but under the current draft agreement there will be a transition phase that will prevent them from doing so. That’s why markets feel getting the drafted agreement approved through parliament is a hard task. There’s also a more significant risk if the conservatives demand a vote of no confidence in May,” said Hussein Sayed, Chief Market Strategist at FXTM. Such a scenario will likely lead to a general election, putting the UK in a much worse position. While the uncertainty is likely to take its toll on the financial markets, economists expect the macro economic impact will be sharp. “A UK economy less open to trade reduces foreign direct investment, productivity and household incomes in the long term. Anticipating this, households and businesses will reduce spending and jobs will be cut immediately,” Dr Pei Kuang, senior lecturer in Macroeconomics, Department of Economics at University of Birmingham, wrote in a recent paper. Additionally, uncertainty about UK’s relation to the EU and domestic policy will put off spending decisions and would pave the way for rising financial market volatility, falling asset prices, and increasing borrowing rates for households and businesses. Analysts say the handling of the whole Brexit process by the UK government has frankly been a total disaster. Today saw several more ministers resign, this time over the Draft Withdrawal Agreement from the EU which was secured last night. With the pressure growing on Theresa May’s position as UK prime minister, sterling is getting an absolute hammering. The GBP/USD, down about 200 pips or 1.5 per cent, has further moved away from the 1.30 handle, trading around 1.2790. Brexit Secretary Dominic Raab became the latest significant minister to quit because he “cannot in good conscience support” the UK’s draft Brexit agreement with the EU. “Although May claims she has secured the backing of her cabinet for the agreement after a lengthy meeting last night, clearly not everyone was on-board. Indeed, several ministers have reportedly spoken against the withdrawal agreement and with Raab quitting, the Conservative backbenchers may decide to force a no-confidence vote in her,” said Fawad Razaqzada, market analyst, Forex.com.